Totally unique, one-of-a-kind, truly luxurious and beautiful pieces of functional art. These nautical boards are a classy entertainment piece on a boat or in the home of a boat enthusiast. The playing points are replicas of actual nautical flag pennant designs. Personalize with a boat’s name or a burgee on playing surface. “Newport” Backgammon Board. Truly luxurious board. With georgous African Rosewood inset with maple. The playing base looks like a beautiful ocean, with a rare and special figured wood that undulates. Right at home on a boat or in the home of a yachtsman. 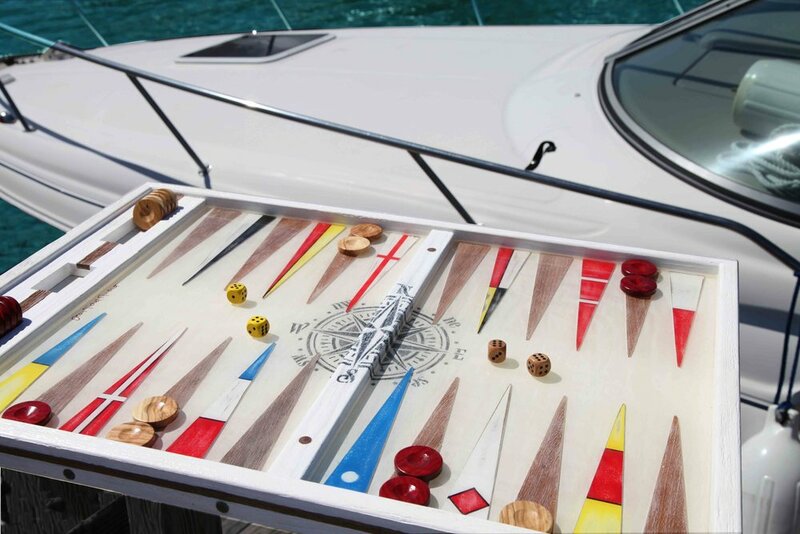 St. Martin Backgammon Board. A casual,easy and lighter palette version of the nautical board. Perimeter inset, pegs and points made of walnut.